It is estimated nowadays that over 70% of domestic doors are made out of UPVC. They are also used actively by business owners. There are some reasons why these doors have become so popular over the past few years: The main advantages of UPVC doors compared with traditional wooden doors is that they are safer, stronger and more affordable. For any assistance with window lock repairs, we are here to help you in just a phone call. Malfunctioning, damaged, or obsolete locks can cause many problems. It may take minutes and sometimes even hours to open a faulty lock and also potential burglars or thieves may take advantage of it. Furthermore, a malfunctioning lock on your UPVC door may cause a lockout situation. As it is important for our customers to get timely assistance, we provide mobile services 24/7. Our licensed technicians are reachable throughout our service area and will drive to your location as soon as possible. You do not need a new door! If your UPVC door lock is not working properly for any reason, in most cases it is possible to repair it without changing the whole door, thus you will save a lot of money and time. 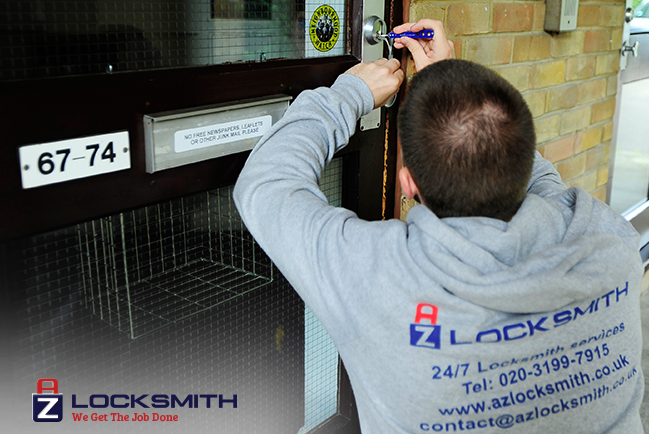 AZ Locksmith technicians are experts in working with UPVC door locks. They can fix your Multipoint or Euro Cylinder Locks quickly and professionally. Our licensed locksmiths work without causing any damage to your door. Sometimes, repairing is not possible and you will need a new lock to be installed on your UPVC door. Our security experts are able to set up a wide range of high-security UPVC door locks. Contact us and our technicians will determine what option will be best for you.